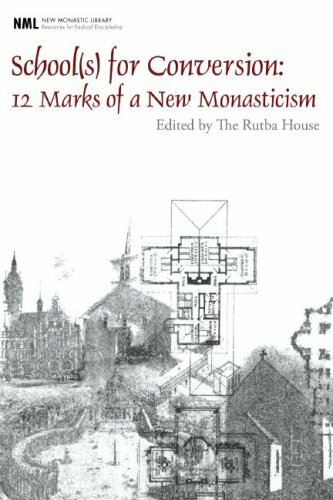 The ‘new’ monasticism differs from the ‘old’ in a number of ways. Here are three, for example: (i) vows of celibacy, poverty and obedience are relatively rare; (ii) while geographic proximity of members is preferable, it is not necessary; and (iii) distinctive religious habits have been largely replaced by non-distinctive Levis. This book attends to these marks, one chapter on each, exploring each theme drawing upon Scripture, contemporary examples, and personal experience. Taking up Alasdair MacIntyre’s challenge to construct ‘local forms of community within which civility and the intellectual and moral life can be sustained through the new dark ages which are already upon us’, the contributors to this volume believe that when such longing as this instructs the church, ‘the local forms of community for which MacIntyre calls are no longer primarily for the sustenance of intellectual and moral life. Nor are they communities that withdraw from the world to insure their own survival and the flourishing of their members. Rather, within the life of the church a new monasticism exists to sustain knowledge of the gospel of the kingdom that was proclaimed, embodied, and accomplished in Jesus Christ. And the communities of the new monasticism exist for the sake of witness to Jesus Christ who is the life and hope of the world’. This book is written not by theoreticians or monasticism-virgins cutting their idealistic and yuppie teeth in a utopian wilderness for a while before retreating back to ‘the real world’. Rather, these challenging essays betray a maturity and realism that one might expect from those who have the runs on the board, so to speak, whose commitment to embodying the kingdom which is truly the life of the ‘real world’ is humbling and utopia-destroying, and who love the church as God’s community in travail and often so slow to be on the way. It is not unlike some of the work John Vincent did with community in Sheffield in the 70’s and 80’s. The search for disciplined community for disciples was then and, I suspect, now is still deeply counter-cultural which sits uncomfortably with our regular members who instinctively know that how church is doing at the moment is not how it “should” be. Are you able to cite the piece you quoted from MacIntyre please? The MacIntyre quote comes from After Virtue: A Study in Moral Theory (London: Duckworth, 1981), 244. Interesting how the times set the agenda. Shortly after my return from Sheffield in ’84 I came across a book of essays on Post-modern theology and Moltmann was also writing that the search for authentic community was at the heart of the post-modern condition, and of course there is the work of Scott Peck in The Different Drum. I have to admit it has shaped my approach to ministry and why the church (in its local, regional and national expressions) is important for society in general. Thanks for posting this and the links. They appear to be the books/info I’ve been looking for and the folks I’m in community with. Blessings to you.